If you love to travel in comfort & Luxury then Bucks Travel should be your first choice. We also offer standard & Luxury Minibus hire with driver in Amersham and surrounding areas. You can choose from our variety of fleet from 6-32 seater coaches. Amersham is a market town and civil parish within the Chiltern district in Buckinghamshire, England, 27 miles (43 km) North West of London, in the Chiltern Hills. It is part of the London commuter belt. Amersham is 15 miles (24 km) from Aylesbury and 13 miles (21 km) from High Wycombe. There are many places to visit in Amersham. •	Old Amersham, St Mary’s Church is the parish church of Old Amersham dates to around 1140 but much of the building we see today dates from a 13th-century restoration and 14th-century additions. The south porch and tower were added in the 15th century. The tower is notable for its octagonal stair turret decorated with spirelets. •	Amersham Museum is housed in a half-timbered merchant's hall dating from the 15th century. Within the hall are exhibits tracing the history and archaeology of the area, including medieval wall paintings, lacemaking, costumes, fossils, and local crafts. •	Little Missenden, St John's Church is an early 12th-century church boasting a very nice series of 13th and 14th-century wall paintings mixed with later 17th-century paintings. Though the oldest parts of the current building date to the 12th century, there was a church on this site since about AD 975. •	Chenies, St Michael's Church is a late 15th-century church within the grounds of Chenies Manor. The current church replaced a 12th-century structure made partly of wood. The only bits of the Norman church to survive are a section of a column capital and the 12th-century font. The 15th-century rebuilding was the work of Sir David Philip (Phillips), husband of Dame Agnes Cheyne. •	John Milton's Cottage is in the heart of the pretty village of Chalfont St Giles stands this attractive 16th-century cottage that was the home of poet John Milton. It was here that Milton completed his great work, Paradise Lost. The ground floor of the house is now a museum relating Milton and his times. And other many historical places to visit in Amersham, so book a Luxury or Standard Minibus/Coach 6-32 seater for visit of these famous place. Executive Taxis, Luxury and Standard Minibus Hire with driver 8, 12, 16, 19 & 22 Seater- Covering Amersham & all Surrounding areas. If you are looking for an Executive Taxis or 8-22 seater Minibus Hire in Amersham, with a driver, you are in the right place! We offer Executive taxi Service, Luxury & Standard Minibus Hire with driver in Amersham and surrounding areas. You can hire our Executive Taxis, Luxury or standard Minibus Hire 8, 12, 14, 16,19 & 22 seater at affordable cost. We operates throughout Buckinghamshire, Oxfordshire, Bedfordshire and Hertfordshire areas. Our minibuses are ideal for large groups or parties who can all travel together rather than travelling in separate vehicles. We offer Luxury, Executive and Standard Minibus Hire with driver. All drivers are CRB checked All our vehicles filled with all the safety features, fully Air-conditioned. Our drivers will take care of your every need and will make sure you enjoy your trip. 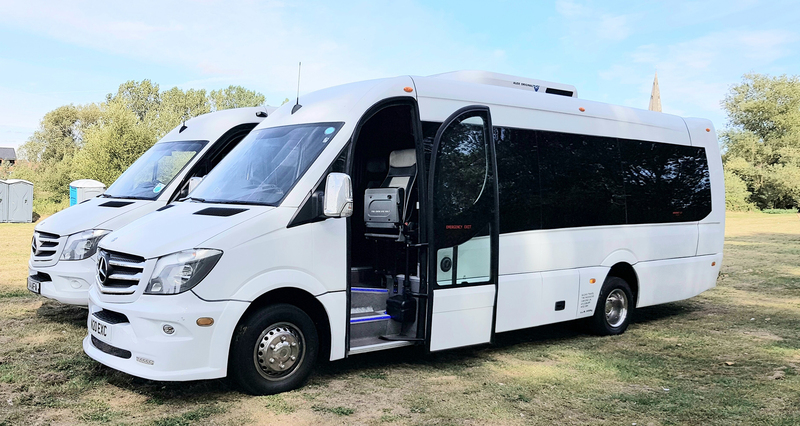 We pride ourselves on our exemplary reputation for providing an outstanding service while exceeding our clients expectations, Bucks Travel (Amersham Minibus Hire) provide a competitively priced, reliable service tailor made to match your individual executive travel requirements in Amersham. If you love to travel in style and comfort then Bucks Travel should be your first choice. We also offer minicab and minibus service in Amersham and surrounding areas. You can choose from our variety of fleet from minicabs to 16-32 seater coaches. Amersham is a market town and civil parish within the Chiltern district in Buckinghamshire, England, 27 miles (43 km) North West of London, in the Chiltern Hills. It is part of the London commuter belt. Amersham is 15 miles (24 km) from Aylesbury and 13 miles (21 km) from High Wycombe.There are many places to visit in Amersham.Old Amersham, St Mary's Church is the parish church of Old Amersham dates to around 1140 but much of the building we see today dates from a 13th-century restoration and 14th-century additions. The south porch and tower were added in the 15th century. The tower is notable for its octagonal stair turret decorated with spirelets.Amersham Museum is housed in a half-timbered merchant's hall dating from the 15th century. Within the hall are exhibits tracing the history and archaeology of the area, including medieval wall paintings, lacemaking, costumes, fossils, and local crafts.Little Missenden, St John's Church is an early 12th-century church boasting a very nice series of 13th and 14th-century wall paintings mixed with later 17th-century paintings. Though the oldest parts of the current building date to the 12th century, there was a church on this site since about AD 975.Chenies, St Michael's Church is a late 15th-century church within the grounds of Chenies Manor. The current church replaced a 12th-century structure made partly of wood. The only bits of the Norman church to survive are a section of a column capital and the 12th-century font. The 15th-century rebuilding was the work of Sir David Phelip (Phillips), husband of Dame Agnes Cheyne.John Milton's Cottage is in the heart of the pretty village of Chalfont St Giles stands this attractive 16th-century cottage that was the home of poet John Milton. It was here that Milton completed his great work, Paradise Lost. The ground floor of the house is now a museum relating Milton and his times. And other many historical places to visit in Amersham, so book a minicab or 8-22 seater coach for visit of these famous place.You can book online or call on our 24/7 booking helpline number i.e. 03333 444 165. All our vehicles filled with all the safety features. Our drivers will take care of your every need and will make sure you enjoy your trip.